London: Universal Edition, 1967. Wraps. Very Good. Folio. Score. UE 14686. Previous owner's signature, wraps with some soiling, else fine. All participants carry a walking stick or perhaps an umbrella. The performers walk along lanes constructed to form a regular pentagon. Longmead, Shaftesbury, Dorset, 1989. Trade paperback. Near Fine. Octavo. xi, 146 pp. Some wear to wraps, else fine. Texts by Karlheinz Stockhausen ; selected and translated by Tim Nevill. Contents: Preface--Master musician and mystic; 1. Stockhausen as myth; 2. Spiritual dimensions; Beyond global village polyphony; 4. Intuitive music; 5. Supra-humanisation; 6. Synthesis. 7. Light--The summation; 8. The way ahead; Appendices-- 1. Chronology of life and works; 2. Five revolutions since 1950; 3. Comes awakening, comes time . . .; To the International Music Council; 5. Mantra; Sources; Selected Discography; Selected Bibliography. Boston, Mass. : Ione Press, 1970. Wraps. Near Fine. Quarto. Score, 46 pp. One part (Clarinet in A), 16 pp. Previous owner's signature on wraps of score and part, some light bumps and creases to edges, else fine. For flute, clarinet in A, horn in F, oboe, and bassoon. Plate numbers E.C.S. 2072 and E.C.S. 2072 b.
Miliano, Italia: Edizioni SuviniZerboni, 1957. wraps. Very Good. Folio. Parts in five volumes. Folio, very good. Black line facsimile. For clarinetto in Sib, clarinetto basso in Sib, Violino, Violoncello, and Pianoforte. Plate S. 5427 Z.
Symphonie No. 2 pour cordes et trompette ad lib. Paris: Editions Salabert, 1994. Wraps. Very Good. Quarto. 47 pp. Written 1941, copyright 1942, later printing. Quarto, Plate number E.A.S. 14,303. "Commissioned by Paul Sacher for the Basler Kammerorchester (BKO). First performance at Zurich on May the 18th, 1942. by the Collegium Musicum, conducted by Paul Sacher." Bratislava, Czechoslovakia: Slovenske vydavatel'svo krasnej literatury, 1959. :Variations on own themes in form of symphonic suite for full orchestra. 153 pp., folio, full score. Some wear to wraps, light print-through on pages. In five movements. Suchon (1908-1993) was ''the last member of the generation of composers that created an identifiable Slovak art music from the romantic composers of the region in the 19th century and the school of early Czech nationalism, a generation which will be best remembered by the triumvirate of Alexander Moyzes (1906-1984) and Jan Cikker (1911-1989), of which Suchon was the middle and perhaps most influential member. Wordlcat locates 7 copies.. Wraps. Very Good. Folio - 13'' X 10.5''. London: Hawkes & Son, 1949. 55 pp. full score, folio. Price sticker on wraps, pages tanning toward edges. Dedicated to Zolton Seikely. PN B & H 16230. London: Hawkes & Son, [c. 1949]. Antokoletz 60, Sz 90. Transcription of Sz 89 for violin and piano. I. Moderato ''Lassu''; II. Allegretto moderato ''Friss..'' 1928, revised in 1944. Dedicated to Zoltan Szekely. 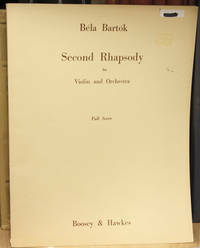 First performed November 26, 1929 by Zoltan Szekely, Erno Dohnanyi conducting, Budapest. First thus. . First Edition. Wraps. Very Good. Folio 12.25'' X 9.25''. 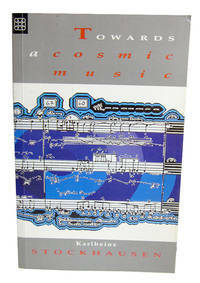 New York: Society for the Publication of American Music ; G. Schirmer 36 pp, score. 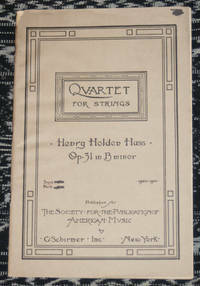 Society for the Publication of American Music 1925-1926. (S.P.A.M.). Published for the society by G. Schirmer c1926. 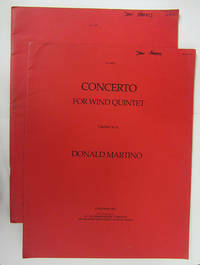 The second and last movements of this quartet are based on American Indian themes. Themes from second mvmt. from Natalie Curtis's The Indian Book, themes from third mvmt. noted by composer in the villages of Santa Clara and Tesuque New Mexico. His immersion in Native American music in the 20s was capped by his orchestral suite Indian Dances (1927-28), which was performed by Stowkowski in Philadelphia.. Wraps. Very Good. 8vo - over 7¾" - 9¾" tall. New York: Society for the Publication of American Music; G. Schirmer, 1921. 49 pp. Score. Some foxing, rusted staples, small chip from back wrap. 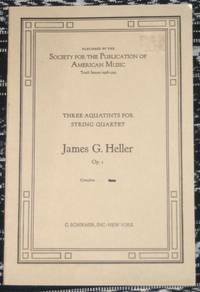 Society for the Publication of American Music. (S.P.A.M.). 1920-1921 season. Published for the Society by G. Schirmer, New York, copyright 1921. G. Huss (1862-1953) was the founder of the American Guild of Organists. 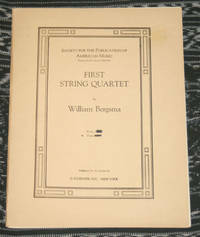 This string quartet was first performed by the Berkshire String Quartet on July 2, 1919. 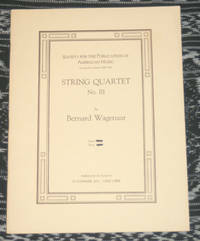 This work of Mr. Huss's [is] the best string quartet that I know produced in America--Walter Kramer. . Wraps. Good. 8vo - over 7¾" - 9¾" tall. 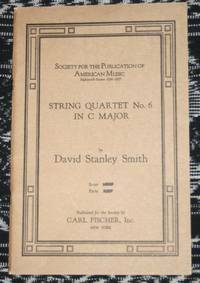 New York: Society for the Publication of American Music; Fischer & Bro. 36 pp. score. Society for the Publication of American Music. (S.P.A.M. 36) Sixteenth Season 1934-35; Published for the Society by Fischer & Bro. New York, copyright 1935. Dedicated to the Cleveland Quartet: Josef Fuchs, Carlton Cooley, Rudolph Ringwall, Victor de Gomez. 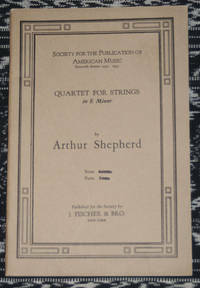 Shepherd (1880-1958) was assistant conducter of the Cleveland orchestra and professor at Case Western University. His papers are at the University of Utah.. Wraps. Very Good. 8vo - over 7¾" - 9¾" tall. Society for the Publication of American Music 49 pp. Score. Society for the Publication of American Music. (S.P.A.M.). Tenth Season 1928-1929. Published for the Society by G. Schirmer, New York, copyright . Dedicated to the Heermann Quartet. VG. Rabbi James G. Heller (1892-1971) wrote program notes for the Cincinnati Orchestra from 1924 to 1941.. Wraps. Very Good. 8vo - over 7¾" - 9¾" tall. Torino: Editioni di Torino EDT/Musica, 1988. xii, 315 pp. Bumping to corners and some rubbing and soiling, else very good. In Italian. 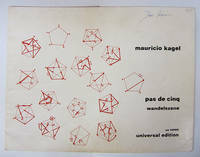 Contents: Presentatzione; Prefazione; Nota dell'editore; Parte Prima: Un'autobiografia dell'autore racconta da Enzo Restagno; Parte Secunda--Le Opera: Xenakis, ''profeta dell'insensibilita'' (Milan Kundera); L'ellenismo di Xenakis (Francois-Bernard Mache); Costruzione come informazione cifrata. Sulla musica di Iannis Xenakis (Rudolf Frisius); Il teatro di Xenakis (Maurice Fleuret); Musica est exercitum arithmeticae . . . (Ernesto Napolitano); Da ''Cendrées'' a ''Warg'': quindici anni di creatività (Harry Halbreich); Sul tempo (Iannis Xenakis); Appendice (a cura di Giorgio Pugliaro); Catalogo delle opere; Nota Bibliografica; Nota Discografica; Indice dei nomi. . Wraps. Good. 8vo - over 7¾" - 9¾" tall. New York: Society for the Publication of American Music; G. Schirmer Quarto. Score. 36.pp.(S.P.A.M. 55) Twenty-Seventh Season 1945-46. Published for the Society by G. Schirmer, copyright 1948. Dedicated to the Walden String Quartet.. Wraps. Very Good. 4to - over 9¾" - 12" tall. New York: New York Philharmonic, 1999. 47 pp. Wraps are rubbed at edges, inside fine. 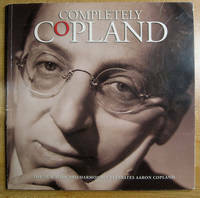 Many wonderful pictures of Copland and others. Contents: Carlos Moseley: Fanfare for the Uncommon Man, Chairman Emeritus, former Managing Director and President of the New York Philharmonic, salutes Aaron Copland; Michael Steinberg: The Voice of America, Aaron Copland didn't just define American music in this century--in many ways he embodied it; Copland: 100 Years: A timeline tracing the history of Copland's connection to the philharmonic, compiled by the staff of the New York Philharmonic Archives; Vivian Perlis: The Man Behind the Music: We all know the music--but what of the spirit behind the scores; Leonard Bernstein: ''Aaron and Moses'': Leonard Bernstein and Aaron Copland shared a friendship that began in 1937 and ran through the rest of their lives. In 1975, to mark Copland's 75th birthday, Bernstein wrote an appreciation of his friend and colleague; Completely Copland: A complete listing of all the Completely Copland events--concerts, discussions, lectures, screenings, and more; On Copland: Quotes from the people who knew the composer and from performers in the Completely Copland celebration appear throughout, complied and edited by Robert Sherman, including Kurt Masur, Deborah Borda, Marilyn Horne, William Warfield, Thomas Stacy, Stanley Drucker, Andre Previn, Marin Alsop, Leo Smit, Ned Rorem, Michael Borikin, Verna Fine, Peter G. Davis, David Diamond, Garrick Ohlsson, David Raksin, and Leslie B. Dunner. Wonderful illustrations in addition to many photos of the composer include Kostelanetz's score for A Lincoln Portrait, signed not only by Copland, but several people who narrated: Carl Sandburg, Mayor John Linsay, Marian Anderson, E. G. Marshall, and Walter Cronkite, and a Hirschfeld portrait. . Wraps. Very Good. 8vo - over 7¾" - 9¾" tall. New York: Society for the Publication of American Music; Carl Fischer , 1937. 47 pp. Score. Society for the Publication of American Music. (S.P.A.M. 40) Eighteenth Season 1936-37; Published for the Society by Carl Fischer, New York, copyright 1937. Some tanning to extremities and in gutter. VG. 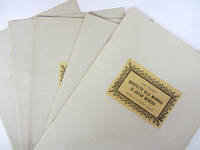 List of the societies publications on back of wraps. Dedicated to Elizabeth Sprague Coolidge. Smith studied at Yale with Horatio Parker at the same time as Charles Ives and after studying with Ludwig Thuile and Vincent d'Indy succeeded Parker at Yale. . Wraps. Very Good. 8vo - over 7¾" - 9¾" tall. 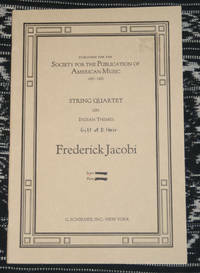 New York: Society for the Publication of American Music; G. Schirmer Parts, quarto, 12 pp. 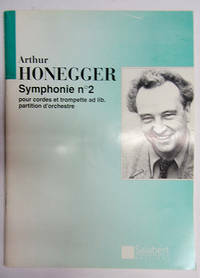 ; 12 pp. ; 10 pp. ; 9 pp. Four parts, very good in very good wrapper. (S.P.A.M. 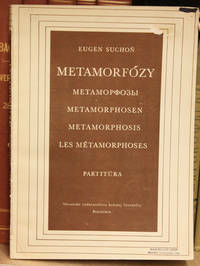 53) Published for the Society by G. Schirmer, copyright 1946. The string quartet was written in 1942. The composer of The Wife of Martin Guerre (1956) and The Murder of Comrade Sharik (1973) the latter based on Bulgakov's Heart of a Dog.. Wraps. Very Good/Very Good. 4to - over 9¾" - 12" tall. New York: Society for the Publication of American Music; G. Schirmer Quarto. Score. 35 pp. (S.P.A.M. 52) Twenty-Fifth Season 1943-44. Published for the Society by G. Schirmer, copyright 1945. G, a bump to top with attendant creases. Discoloration at extremities. 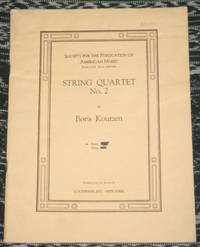 Koutzen (1901-1966) was born in Russia and studied composition with Gliere. Arriving in the United States in 1923, he became a violinist in the Philadelphia Orchestra under Stokowski and taught at the Philadelphia Conservatory and at Vassar.. Wraps. Good. 4to - over 9¾" - 12" tall. New York: Society for the Publication of American Music; G. Schirmer Quarto. Score. 22 pp. (S.P.A.M. 44) Twenty-First Season 1939-40. Published for the Society by G. Schirmer, copyright 1940. . Wraps. Very Good. 4to - over 9¾" - 12" tall.